The RS600s had a first get-together in several years at Grafham Water Sailing Club over the weekend of the 3rd/4th September, instigated by various exchanges on the well-supported Facebook page. The weekend consisted of an informal get-together on the Saturday, with racing on the Sunday. Saturday kicked off at about 11am with general introductions to the club (and each other! ), and the plans for the weekend. Once on the water, most of the fleet spent time blasting up and down the length of the lake on beam reaches, enjoying what is arguably the most fun point of sail on an RS600. The new cloth, new cut mainsail was also being put through its paces by Mark Rushton; it has received positive feedback from those who have trialled it so far. Lee Bratley (who would have been sailing, but for a recent boat breakage) kindly still came along to lend us is camera skills! The fleet then joined in with Grafham's "Sociable Saturday" racing, sailing off a separate start and over a slightly extended course. 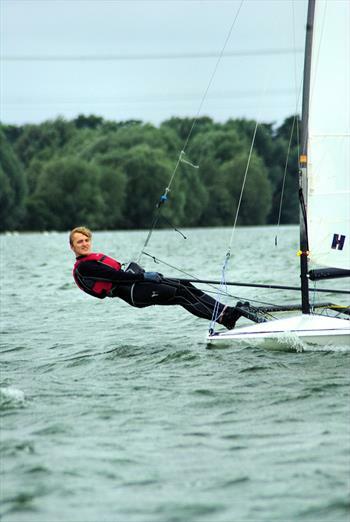 Good fun was had by all, especially with the holes in the wind to be found when tucked under a windward shore at Grafham. After retiring to the pub for dinner and drinks for Saturday evening, the fleet gathered again bright and early on the Sunday morning. 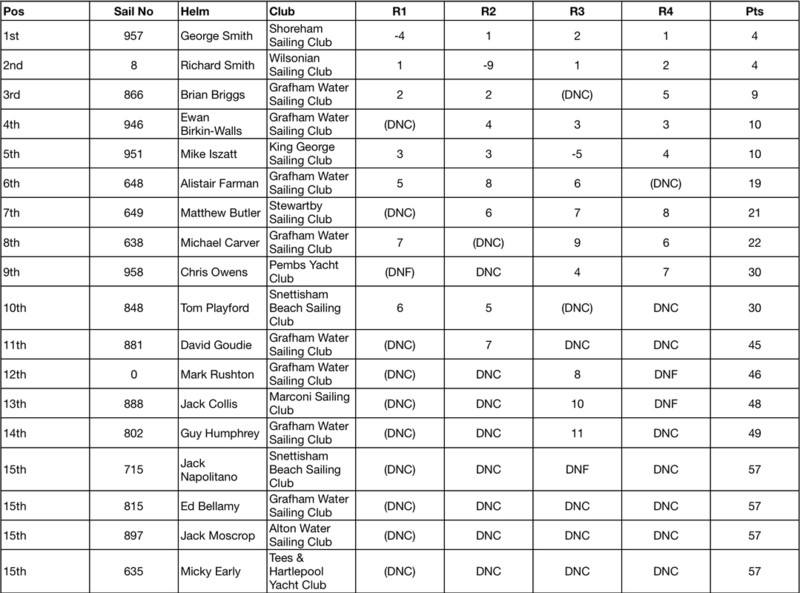 Racing was a little more serious (but only a little...), with four races (three to count) being sailed over the same trapezoidal courses as the club racers, but again with a separate start. In the first race, Richard Smith showed the fleet the way to go, his reefed sail allowing him to disappear upwind at quite a pace. Richard was able to maintain this lead over the reaches and run, before building the lead again on subsequent laps. With the wind easing slightly, Richard went in to revert to full rig but hadn't accounted for the swift turn-around of the Grafham race office for Race 2, which made life easier for George Smith to win the second race. Races three and four, held after lunch, were in clearing skies, with the wind remaining strong throughout. Again, the racing was dominated by the visiting Smiths (George and Richard), with Ewan Birkin-Walls and Brian Briggs leading the Grafham defence. This wasn't enough though, with overall victory going to George Smith (Shoreham SC), won on countback from Richard Smith (Wilsonian), with Brian Briggs third. First prize was a pewter tankard, kindly provided by the Boatyard at Beer (the RS600 rights holder), with a bottle of Whisky donated by Grafham sailor Dave Goudie to Chris Owens for having travelled the furthest (Pembrokeshire!). With a total of 21 sailors supporting the event over the course of the weekend, the RS600 class are now looking to build on this momentum. Plans have been drawn up for four events next year (details to follow on the Facebook group! ), including a return to Grafham. We would all like to thank the race officer and his team at Grafham for some good courses and efficient organisation, and for providing extra rescue cover on the Saturday. Finally we would also like to thank the Boatyard at Beer for their support and the donation of the first prize.